This is a simple hot chocolate recipe that makes a delicious jar gift or a great pantry staple to keep on hand yourself. It’s also a popular jar mix for children to prepare as gifts for their teacher, babysitter or grandma because it’s one of those little things that isn’t too expensive, or too “over the top”, but is almost always received with pleasure. For your own gift list, think: office colleagues or co-workers; neighbours; the paper boy; or the superintendent of your apartment building. Place all ingredients in a large mixing bowl and stir well. For a finer mix, combine all ingredients in a blender or food processor and mix well. If desired, print the hot chocolate directions label shown here. Attach the label to the jar with white glue, or tie on around the lid with ribbon and a couple of short cinnamon sticks. Decorate the jar lid with a circle of fabric or lace, tied on with ribbon or raffia. 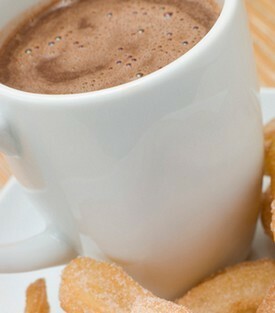 For Mocha Hot Chocolate, place 2 or 3 tablespoons of hot chocolate mix in a mug and fill with hot coffee. After processing all other ingredients in the blender or food processor, empty mix into a bowl and stir in 1 cup of mini marshmallows. Replace the plain non-dairy creamer with a flavored creamer such as French Vanilla or Hazelnut. For spiced hot chocolate, add 1 teaspoon of cinnamon to mix, or ½ teaspoon nutmeg and ½ teaspoon of cinnamon. For raspberry hot chocolate, add one package of raspberry koolaid to the mix and increase the sugar to 2 cups.